Demystifying the Drupal hook system. 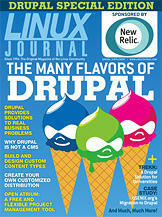 Prepackaged distributions are being heralded as a new era in Drupal development. Learn how to make your own one-click downloadable and shareable Drupal distribution. Even with hundreds of thousands of Open Atrium installs, its most powerful feature is often never taken advantage of—it's an open-source project. Everyone using Drupal needs to host their site somewhere. However, most people building sites with Drupal do not also want to have to become experts in building a reliable, scalable infrastructure for hosting it. Implement a native Drupal CRM solution. How to create your own distribution of Drupal. Learn how Trekk addresses content sharing challenges. Building and designing custom content types is easier now that a full Content Construction Kit is built in to Drupal 7 core. Expert tips on how to build Drupal distributions and features that integrate cleanly on any site. Techniques for boosting your Drupal site's performance. USENIX.org was migrated from static HTML into a Drupal-based CMS, making use of many of Drupal's greatest strengths: e-commerce, integrations with other services, Apache Solr search integration and microsites. Contributing to Drupal is easy and rewarding.